Pool Connection is Celebrating 25 Years of Business in 2019! Going to the EXTREME for our customers since 1994! *Get $50-$150 back on select Pentair products. Make your purchase April 1, 2019 through September 30, 2019 and get a Pentair Visa Prepaid Card. It's the investment you can't afford NOT to make! 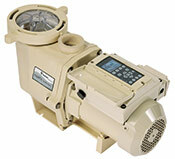 When Pentair® first introduced IntelliFlo Variable Speed technology, it set off a marketplace revolution with its energy efficiency, near-silent operation and long service life.The IntelliFlo Variable Speed Pump further refines the field-proven advancements that have led IntelliFlo pumps to outsell all other variable speed brands combined. *Savings based on variable speed pump compared to a single-speed pump running 12 hours per day at an average of $0.16 per kWh in a 20,000 gallon pool. Actual savings may vary based on pump horsepower, pump rpm, plumbing size and length, pump model, service factor and other hydraulic factors. Three year warranty is only applicable to IntelliFlo® 2 VST and IntelliPro® 2 VST pumps purchased from a retail store (brick and mortar), pool builder or pool service company. POOL CONNECTION has been a Salt Water Pool Conversion Specialist since 1994! * Don't let just anyone convert your pool........go with the BEST! * We've installed more salt systems in the DFW area than anyone! * Swimming pool repair and service is our FULL TIME job! * You can be confident you've chosen the right company for the job. * You will be dealing directly with the owners. STOP BUYING CHLORINE with this earth-friendly alternative! Instead, equip your existing swimming pool with an IntelliChlor salt water chlorine generator. STOP budgeting for chlorine month after month, year after year! Spend this year’s chlorine budget on an investment that will take the place of buying, handling, and storing all that expensive chlorine and will pay for itself in a matter of months! Your swimming pool will need fewer chemicals and provide you with softer, silkier water. Say goodbye to extreme fluctuations and keep a constant chlorine level! Say goodbye to that overpowering chlorine odor! No more dry, itchy skin or red, irritated eyes! With the IntelliChlor salt water chlorine generator you will get cleaner, healthier water that’s better for your family and the environment! Chloramines, not chlorine itself, are what cause the odor and irritation to the eyes and skin that most swimmers experience when swimming in a traditional chlorine swimming pool. The electrolysis in the cell of the generator and the chlorine that’s produced attack contaminants in the water to help keep these chloramines from forming. Although, salt is necessary for the system to function, the salt is almost undetectable to the tast. The amount of salt in your swimming pool will only be equal to one third the salt of your tears. The content of salt in the ocean is approximately 36,000 parts per million (ppm). Whereas the salt level needed for your salt water chlorine generator, per manufacturer's recommendations, is only around 3,200 ppm. The IntelliChlor chlorine generator uses natural salt to produce a “free” form of chlorine in small amounts that is immediately and directly infused into the pool water for sanitation. When the free chlorine finishes cleaning and disinfecting the water, it naturally converts right back into salt, which is reused to make free chlorine again. Since the free chlorine is made and used within the pool water, this method eliminates the risk of chlorine spills and the use of concentrated forms of chlorine. CLICK HERE TO WATCH A VIDEO CLIP! NO MORE Buying, Handling, or Storing Chlorine! Keeps a CONSTANT Chlorine Level! Pays for Itself in a Matter of Months!